Submitted by: Mary Lathron - Caledonia-Mumford Elementary, New York. Styrofoam Trays (for inks or paint), assorted cut pieces of corrugated cardboard (cut to different size rectangles), white Drawing Paper (or Construction Paper ), choice of Block Printing Inks or paint (Acrylic Paint would be water resistance when dry), Scratch-Art 3D-O's , China Markers or Plastic Tip Markers. Video, book and audio covered in text below. Demonstrate process. Present theme - or let student choose own subject - or create non-objective works. The prints below are made from Styrofoam printing plates... they used one color of ink (actually, I use Chromacryl Acrylics ) - they had a choice of light or dark green for the foliage prints. They printed multiple copies on white paper. The animal image was printed in the same manner - they could use red, orange or yellow ink. When the prints were dry, they hand colored their prints using Sanford plastic markers (they are very crayon-like, but you can sharpen them in a regular pencil sharpener... they are "kind-of" erasable and they are hollow inside... I love them!) 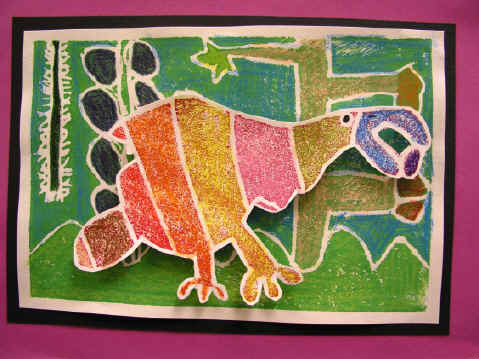 They cut out their animals and mounted them to the foliage prints using the foam Scratch-Art 3D-O's . I use the Dropping in on Rousseau video and book in the beginning stages of the lesson to introduce the lesson/artist etc. While the students are working I play part of the audio cassette from the book called Panther Dream. Awesome rainforest sounds accompanied by music. The book and music is a collaboration by Bob Weir (Grateful Dead) and his sister Wendy. At some point in the lesson I will read the whole book to them... they love it! Note: for 6th grade, you might want to do some reduction printing - reduce plate and print in multiple colors rather than coloring one color prints. Reduction prints will make it more of a challenge for them. See Cathy Topal's Thinking with a Line Be sure to check the student gallery. You can add to it card board cylinder sections for curved shapes (like cut up empty masking tape rolls). You might try using Acrylic Paint as ink so that it will be water resistant when dry. Students can then paint their compositions with water colors. Quite striking is white ink on black paper - then colored with Construction Paper Crayons , pastels or oil pastels. Many teachers would like to pursue some other media in the art room, but diminishing budgets and lack of equipment keep us form trying any "new" things. The following are some ideas on how to bring printmaking into the art room without many extra effort or supplies. 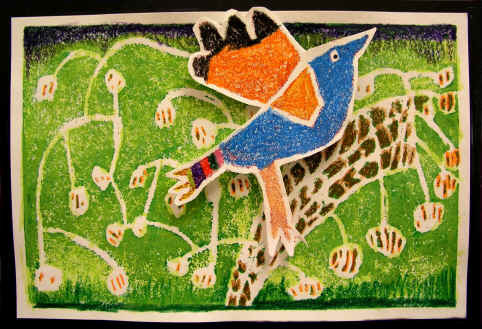 The introduction of printmaking on Styrofoam is a cheap and easy way to initiate the process for all ages. Many of us have obtained large quantities of Styrofoam plates, and parents are always willing to part with the trays, as a exercise in recycling. Just be sure to wash all of these in bleach before handling (nobody like to get food poisoning). Another source of Styrofoam is building sites, where one might be able to get scraps of board. These boards are sometimes thicker or bigger, and might have be cut to proportions appropriate for used in the class room. For making indentations into the foam, one can use anything with a slightly blunt edge: pencils, pens, forks. After applying ink to these plates, the indentations will stay white (or the colour of the paper). Do not forget to tell the class that their design will turn out in reverse on the paper. Many of the students would like to add letters or words to their work. One can also cut the foam into desired shapes, to add to the design possibilities. For ink, many of us have struggled to find an alternative to the expensive water soluble inks. A good substitute is Speedball Water-Soluble Poster Ink . The cost are minimal, about $7 for a liter, but larger quantities are even cheaper. I have tried other brands, but this is the one with the thickest consistency. To colour this, one can get small amounts of universal colouring from the paint store. (These are the colourings one tints paints with). Most stores will give it to you for free, or for a minimal charge of $1 per ounce. You can mix the colours, and add this to the adhesive. To prevent the mix from drying too soon add some drops of Glycerin or some drops of Acrylic Retarder . The dryer the weather the more retarder is necessary. About 7 drops per 125 ml of mix would do. (Thanks to Stephen and Winona Elliott for this recipe). One liter of the mix will last at least for six sessions of 25 students each. The large investment is still the brayers applying the "ink" to the plate, however these can be used over and over again. I also use clean brayers when the paper is on the plate. One or two brayers in the room will do for about 25 students. For palettes I use cookie trays lined with aluminum foil or anything with a flat surface. Set up the work stations so that traffic will flow in the classroom. There should be one station with ink, try one per colour, one for paper and transferring the ink to paper. A bulletin board where prints can dried and displayed works the best. Laying the prints on a flat surface might lead to having prints sticking together. Also, having the prints on the wall makes it easy to review at the end of the session. The students can wash their Styrofoam at the sink, dry it, revise it and/or print it again with the ink. Most students are amazed how much art they can produce in a very short time and might lead them to other forms printmaking. The same ink can also be used for monotype print on Plexiglas. The different colours might make an interesting mix, and again the only thing you need is the Plexiglas. Remnants from commercial sign firms, cut into small rectangles, is a good source. Also Mylar taped to the working surface (such as a desk) which is protected with a skim of some dish detergent is another good way of doing monotypes. This are some of the ideas I have tried in the classroom; that even elementary students get excited about the prints, not to mention their the teachers. NOTE: The teacher suggests using material such as foam board for printmaking. The indentations made with the tools in the foam do not print and show up as white (or the color of the paper). The raised part of the styrofoam is the part that prints with whatever color ink you would use. Brayers are covered with ink on a plate and then rolled on the foam. Sometimes the back of the paper has to be burnished to get a good coat of ink on the paper.